Iron Ore isn't traded like most commodities. Please read the FAQs below. Market Index tracks the industry standard NYMEX traded 62% Fe, CFR China in $US/metric tonne. Iron Ore (Fe) is mined in around 50 countries worldwide and used to make steel (buildings, cars, white goods etc.). Global economic growth is the primary factor that drives its supply and demand. When economies are growing, the need for steel in construction increases which drives the price up. Growth in China (the world’s largest consumer of metals) has affected the price of iron ore so much recently that the spot price can almost be considered a proxy for China’s economic health. Download the 37yr price history. Australia is the world’s largest iron ore exporter (and 2nd largest producer) accounting for around a third of global production . Western Australia holds just over 90% of Australia’s identified iron ore resources and has a reputation for producing consistently high concentrations of around 60%. Rio Tinto (RIO), BHP Billiton (BHP) and Fortescue Metals Group (FMG) account for ~90% of Australia’s iron ore production (2014). View an image of Australia’s 2016 iron ore deposits and operating mines. Why is the price of iron ore so hard to find? Iron ore isn’t traded like other commodities. Benchmark indices collect data every day from industry sources and calculate a "spot price" according to their methodology. As transactions between buyers and sellers can be conducted in closed-door negotiations using different currencies and ore grades, transparency and accuracy can be an issue. A hefty fee is also charged for access to the end-of-day data. As a proxy, most online stockbrokers and charting programs (including Market Index) use the NYMEX Futures price. How is the spot price set? The price is usually set once daily by several major benchmarking companies. The spot price varies between sources as they use different methodologies and grades. Transparency is a potential issue as contract negotiations can take place behind closed doors. Trading can occur almost 24 hours a day and all transactions are transparent. Market Index uses the online broker standard; end-of-day, NYMEX traded 62% Fe, CFR China in $US/metric tonne. Why does the spot price differ between data sources? Benchmark indices have different calculation methodologies and are updated at different times. Although they’re strongly correlated and move in unison, it’s not unusual to see a difference of 4-5% in the price. NAB Trade and Market Index use the most recent trading day’s close. Commsec’s iron ore data is 2 days behind (i.e. two closes ago). In futures trading, there’s a date where traders switch from using the current month’s contract (i.e. data feed) to the next month’s contract. This is called the “roll over” date. Commsec and NABTrade don’t rollover to the next month’s contract until expiry (end of the month). This can cause significant volatility near expiry. Market Index follows conventional rollover dates to prevent large jumps in price near contract expiry. I.e. We start quoting the following month’s Futures Contract about a week prior to the end of the month. Which benchmark should I follow? There are five iron ore benchmarks regularly quoted in the media as the “official” price. The MBIOI-62 index is 62% Fe CFR Tianjin Port (China). It’s used by Bloomberg, most newspapers, and updates at 6:30pm (Singapore). The IODEX is 62% Fe CFR China and updates at 5:30pm (Singapore). Uses 62% Fe CFR China and updates at 6:30pm (Singapore). Uses 61.5% Fe CFR Australia, China Port Spot. It’s used by most Australian full-service stockbrokers under code “ironore.id”. The 62% Fe, CFR China (TSI) Futures traded on the NYMEX. It’s used by Commsec, NABTrade and most online stockbrokers/charting platforms. Metal Bulletin's MBIOI-62 is probably the most quoted benchmark in media. CME Group Futures are the most transparent, accessible and regularly updated price feed, so it's used by most online trading platforms. The industry standard when discussing iron ore is 62% Fe CFR China which is used by all except IRESS. IRESS (used by many stockbrokers) tracks 61.5% Fe CFR Australia under the ticker “ironore.id”. CFR Stands for "cost and freight" and is when the seller must cover the cost of transporting the ore to a destination. I.e. “CFR China” means the purchase price includes delivery to a specific port in China. The iron ore spot price became a mature benchmark in 2008 when Platts started publishing daily assessments. The Steel Index and Metal Bulletin followed suit shortly afterwards. The industry standard specification is 62% Fe (CFR China). Download a spreadsheet of 62% FE spot (CFR Tianjin port) since 1980. A large 2MB image of Australia's iron ore deposits. 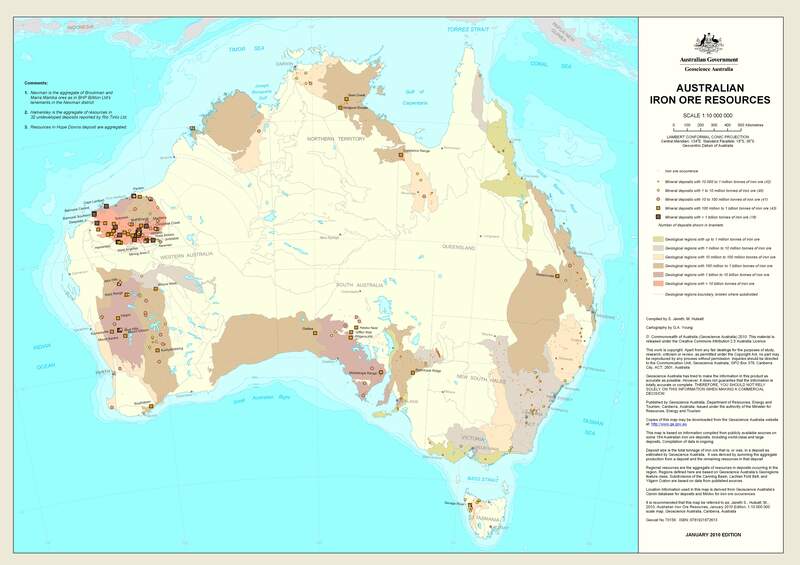 A list of Australia's major minerals with statistics and maps outlining all known deposits and operating mines. Iron Ore Facts - Great little website operated by Minerals Council of Australia. Effects of Changes in Iron Ore Price - RBA Statement regarding the impact on the Australian economy.